I wasn’t looking to learn about Vietnamese tea, but now I’m so glad I did. One of my nicest experiences since being back in Ho Chi Minh City came about almost by accident. Hatvala Coffee and Tea is a great café, centrally located at 44 Nguyen Hue Street, smack bang in the middle of District 1. I first visited the cafe on the suggestion of a friend who is a bit of a coffee addict. Not only do they have an excellent range of delicious food on offer but they also specialize in coffee and tea sourced 100% from Vietnam. When I started to research an article on Vietnamese Coffee, Hatvala seemed to be the logical place to start. Well, I’m afraid the article on coffee was soon relegated down the list. Geoff, the owner, definitely knows his way around all things coffee but our conversation soon turned to his real passion – Vietnamese Tea. Did you know that Vietnam ranks around 5th or 6th in the world for tea production? Most teas require a cool, moist climate which automatically excludes much of the country, especially the lowlands in the South and the Mekong Delta. But despite having a relatively small area to grow tea they still produce enough to export. In fact, some of the Oolong teas produced in the northern mountainous regions and the Western Highlands in the South of Vietnam are even shipped to the highly discerning tea drinkers of Taiwan. While coffee was first imported by the French; tea is indigenous to Vietnam. By volume, most of the tea produced for sale is sourced from plantations. However, many the specialty teas sold by Hatvala are scattered throughout the wilderness. Wild tea trees grow high up on the side of mountains, and some are up to 3 or 400 years old. There are reports that 1000-year-old trees are still alive. These wild teas are gathered by members of the various minority groups from each of the Provinces. Hatvala sources all their tea (and coffee) from Vietnam. From the very beginning, Geoff and his team have nurtured relationships with local growers and processors, many of whom are members of the minority groups. Miss Ngoc, who prepared the tea sampling for me, is from the mountains regions in the North, close to the border with China. As a child, she grew up with tea all around which created a foundation for her in- depth knowledge of the different varieties available around the region and how to prepare the perfect brew. As well as the free tea tasting sessions, Hatvala can provide an informative booklet on regional tea varieties and beautiful postcards featuring tea picking and preparation from around the country. All of these photos are Geoff’s work, taken as he toured around the different provinces choosing teas to feature in the cafe. The last two times I’ve visited Hatvala I’ve ordered the Wild Boar Black Tea. I usually drink black tea as a preference and this one has a delicious full bodied taste. While you might think $3 to $4 is expensive for a cup of tea here in Vietnam; you get at least three cups for the price. Whole leaves are presented in a specialty plunger which can be refilled with hot water and brewed to your taste over and over. The tasting session is prepared in their specialty salon just behind the stairs to the upper level. Despite the very traditional appearance the equipment is state of the art with temperature controlled water and skillfully concealed plumbing. The first tea I tried was the Mountain Mist, white tea. It’s grown and then lightly processed in the high misty mountains of Suoi Giang Province. 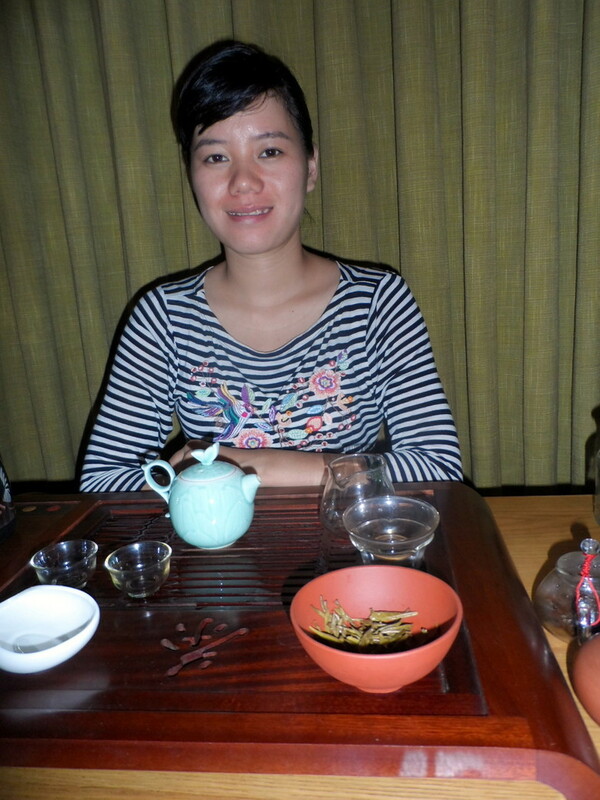 Ngoc carefully prepared the pot and tasting cups by warming them with hot water. The next step was to “wake up” the leaves. After adding them to the pot, she rinsed them with hot water and which she then discarded. The leaves we tasted were this year’s so they didn’t take too much “waking” but apparently this step becomes more important the older the tea is. The water, carefully controlled to 80 C, was then added, the lid replaced and hot water poured over the lid to make the leaves “stand to attention.” That certainly brought a smile to my face as the leaves expanded and stood upright in the pot like little soldiers. 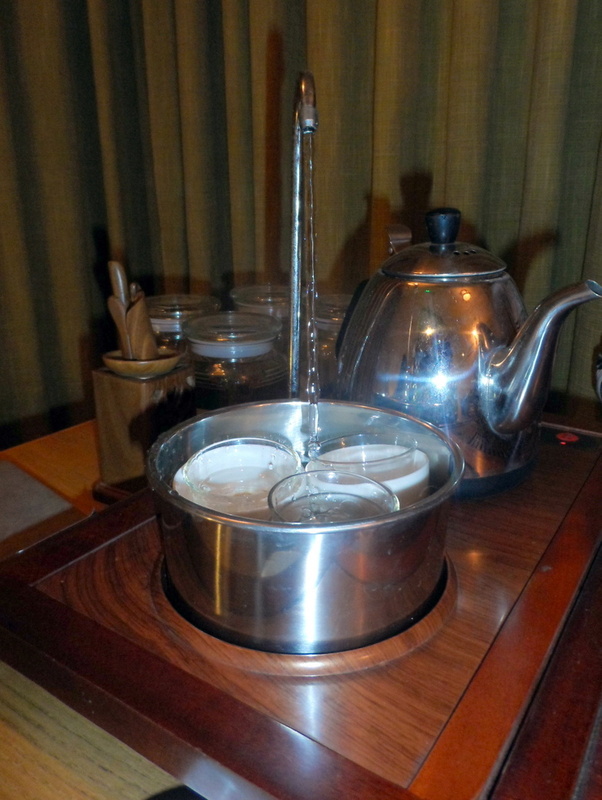 We chatted about the process while the tea steeped for around two minutes. White tea is quite light in flavor compared to green, oolong or black teas. Of course steeping for longer gives a stronger flavor but 2 minutes seemed just right even to my inexperienced palate, completely ruined by tea bags stewed until you can stand a spoon up in the brew. The flavor was light and refreshing and according to a lot of literature, extremely healthy for me due to the high level of antioxidants. Of course, there are many variables for how long you steep the tea before drinking. The amount of leaves you use, the size of the pot and your personal taste will all impact on the length of time you should wait before drinking. The experts at Hatvala recommend around 3.5g of leaves per 100 ml of water to start with and then adjust for your tastes from then on. Water can be re-added several times before the flavor of the leaves begins to wane. The next tea on offer was the Fishhook Green Tea. These leaves are sourced from Tan Cuong in Thai Nguyen province, situated in the lowlands, just north of Hanoi. 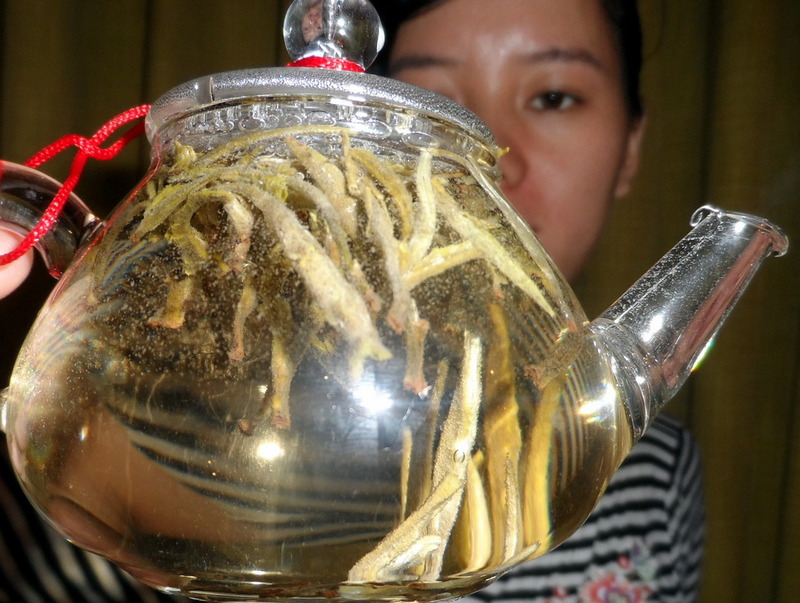 This tea is a “1 leaf, one bud” variety which gives a much higher quality of tea. 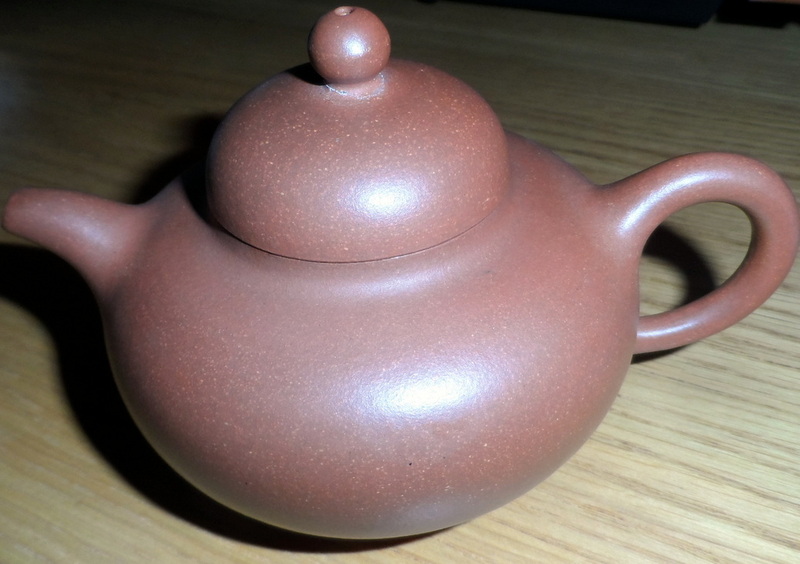 The water for this tea was slightly hotter at 85 C and brewed in an unglazed clay pot. It’s important when using these pots only to use them for one variety as the flavor becomes impregnated in the clay. Using another tea in the pot would be the equivalent of mixing your drinks! Once again the timing was somewhat critical. Too much steeping releases the bitterness from the leaves. The tea has a fresh floral flavor when it’s prepared correctly, and I could almost feel the health benefits coursing through my veins. We moved onto the Wild Boar Black Tea that I had tried several times before in my visits to Hatvala for lunch. It’s sourced from wild tea trees in the high mountains of Yen Bai province and is of exceptionally high quality and character. Despite being called black tea, the color is a rich coppery hue. This tea grows above 1200m where the surrounds are misty, and there is relatively little sunlight. The leaves grow more slowly, and the flavor of the tea is more robust. Black tea is prepared with boiling water to release the full flavor. The last tea of the day was a fragrant Jasmine tea called Autumn Jade. Geoff and Ngoc explained the complicated, labor intensive process that goes into making a quality product. The leaves themselves are green tea from the Thai Nguyen province. They are which is then taken to Hanoi and infused with jasmine fragrance. The processors lay out the leaves and cover them with Jasmine blossoms in the evening. As the flowers open and release their scent, it infuses the leaves. The mixture is gathered up, separated and the process repeated over a period of 4-5 days. It is only prepared between April and October, and the process is all natural. Expertly made by Ngoc, the resulting flavor and fragrance were wonderfully refreshing and almost “heady”. It’s important to note that many Jasmine teas that are mass produced have the flavors added artificially which of course will result in a product of lesser quality. These are just four of the fabulous teas available from Hatvala. They have a range of 8 or so and are continually investigating new products. If, like me, you are worried about being pulled up by Customs on your way back into your country, don’t. Geoff has carefully researched the issue and provided you take whole dried leaves from the tea plant, and you declare them; you should have no problems in getting them home. You can even take it to for Australia, which has notoriously strict customs regulations. Geoff has several clients he ships to on a regular basis. So if you are looking for a unique experience while you’re visiting Ho Chi Minh City then drop into Hatvala for a relaxing cup of one or more of the best Vietnamese Teas available anywhere in the world. Book in for a tea tasting to find out which one (or more) suits your palate and grab yourself a souvenir packed with health benefits that will keep on giving when you return home. If you find you can’t do without your new favorite brew, Geoff can always ship you some more.